Alberta’s new dementia strategy supports and values families from the onset of dementia through to end of life. Minister Hoffman with participants of the Moving for Memory program practising memory exercises. That Albertans understand the impact of dementia and actively work towards optimal brain health. 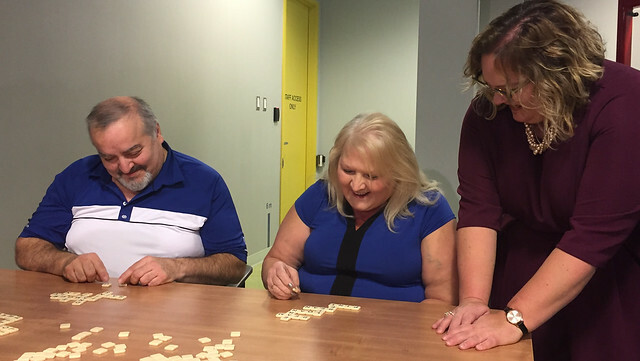 That Albertans living with dementia and their caregivers are supported in their communities. Timely recognition, diagnosis and clinical management through primary health care, supported by specialist services. Timely, accessible, integrated and high-quality dementia care and services. Since 2015, roughly $6.8 million has been invested in measures to give families tools to support their loved ones living in their home communities. The new plan calls for other improvements to help Alberta families, including increased rural specialist consultations, improved mental health supports and better transitions for patients moving between different care settings. Over 42,000 Albertans were diagnosed with dementia in 2016, but the risk of developing dementia doubles every five years beyond age 65. As the population ages over the next 30 years, the number of Albertans living with dementia is expected to grow to more than 155,000. The new plan also aims at broader changes to reflect the demographic shift. It aspires to make Alberta a leader in dementia research, with a trained and supported workforce, bolstered by a comprehensive framework to guide measurement, monitoring and reporting. The strategy was developed in collaboration with Albertans living with dementia, their caregivers and front-line organizations that deal with dementia. Expanding the First Link program ($1.95 million): An early intervention program to connect patients and caregivers with supports as soon as possible after a dementia diagnosis. Mental Health First Aid Seniors ($530,000): Free public training on how to respond to a mental health issue as it develops. Seniors Health Strategic Clinical Network ($4.1 million): There are several projects currently underway through Alberta Health Services. Health Link 811: Specially trained dementia nurses currently average nearly 10 referrals per week. Community innovation pilots: Eight programs are currently underway, including programs that integrate exercise, art and music in dementia care, as well as other innovative dementia support models. Appropriate Use of Antipsychotics Program.